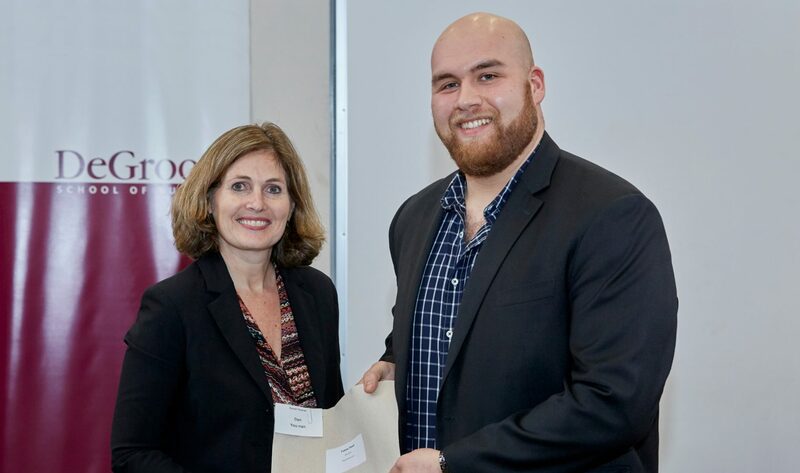 Dan Younan, seen here with DeGroote School of Business Associate Dean (Academic) Sue McCracken, gave up football to focus on school. He graduated with distinction this fall. Photo courtesy of Dan Younan. When Dan Younan started university, he was a highly recruited high school football star who wanted to study commerce, but couldn’t get into a business program because his grades weren’t — yet — good enough. He recently graduated with distinction from the DeGroote School of Business, and is pursuing a graduate degree at the University of Windsor. He’s also about to start a job at an accounting firm and wants to be a professor some day. Football is no longer in the picture. As a first-year student, Younan gave Social Sciences a whirl, but his heart was always in the business courses he was taking. With each new class he took, Younan became more determined to stick with the program and study accounting, even as his commitment to football took over more and more of his time. His first two years, he played in every game. But he stayed the course in both for as long as he could, and he forged relationships in both: Most of his roommates and close friends were on the football team with him, and he grew closer to many of his fellow business students. Finally, as he was going into his third training camp, in 2016, Younan made the call: He gave up football. “It was not an easy decision, but I had to look at my situation and see what I really love and what was best for me in long run,” he says. The more classes he took, the more he realized he had a new interest: Teaching. “I’m really hoping to get into teaching some day,” he says. “In my fourth year I got to work for Assistant Professor Aadil Merali Juma as a TA, and I was lucky — he put a lot of faith in an undergrad who had never taught before, and I got to lead a tutorial. I really enjoyed it. “I have a new job coming up, and I’m going to work in accounting, but I hope one day I can become a professor,” he says.